There are no obvious natural attractions in the central part of east Oregon; north of the Great Basin Desert of the southeast this part of the state is very lightly developed, crossed by only a few roads, between occasional small towns. Several high mountain ranges rise over 6,000 feet, but most of the land is more gently hilly, covered by short grass or trees at the higher elevations, and split by many winding valleys. 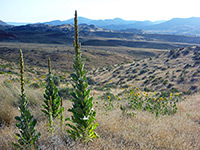 The mountains are part of national forests (Ochoco, Malheur and Umatilla), while the remainder is privately owned, sectioned off into large ranches, many reached by unpaved roads. The underlying rocks in this region are sedimentary, dating from the Paleogene period, and have been known since the 1860s to be extraordinarily rich in animal and plant fossils, containing both a great variety of different species and spanning a large amount of geological time, encompassing most of the age of mammals - between 7 and 44 million years ago. 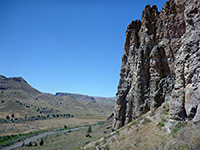 Rocks are exposed at many locations along the river valleys; outcrops of brightly colored sandstone and mudstone in alluring shades of red, yellow, grey and blue, and three of the most fruitful fossil locations are contained within separate units of John Day Fossil Beds National Monument, a little-known NPS preserve named after the main river flowing through this region. This, one of the longest undammed rivers in the US is one of several locations in Oregon named in recognition of the achievements of John Day, a pioneer hunter in the early 19th century. As with other paleontological national monuments in the West like Fossil Butte in Wyoming and Florissant Fossil Beds in Colorado, fossils are for the most part not present in situ, having been removed when found; instead, the appeal of John Day Fossil Beds NM is in the scenery, of colorful badlands, eroded ravines and rugged cliffs, but also in the solitude and remoteness. The lack of any spectacular landscapes and the large distance from any well known places mean that few people visit, so the starkness and emptiness of the surroundings are enhanced by the general lack of people. The largest segment of the national monument is the Sheep Rock Unit, extending 12 miles along the John Day River at the south end of highway 19, which joins US 26, an intersection 78 miles east of Prineville, the nearest major city. 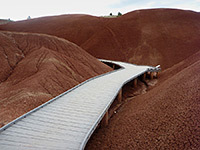 Here are found a historic ranch, a museum and visitor center, several short trails to fossil sites and overlooks, plus one longer (3 mile) loop around a deeply eroded ravine through blue-grey badlands. 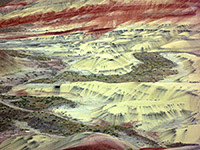 Thirty five miles west, the Painted Hills Unit also contains fossil sites but the main point of interest is the beautiful, undulating, banded hills, variously yellow, brown and red in color, a landscape especially pretty near sunset. The smallest, most remote and least visited unit is Clarno, 80 miles by road from Sheep Rock. 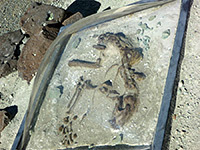 This is centered on a cliff face on the north side of a John Day River tributary, in which are found a variety of embedded fossils. 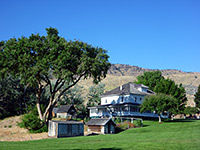 There is no entrance fee for any of the three units, no campground, and few facilities; apart from the visitor center, ranchhouse and museum at Sheep Rock, the national monument contains only trails, overlooks and picnic areas.